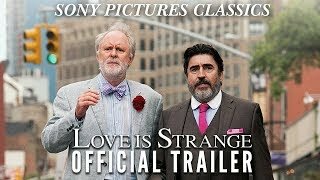 Love is Strange release date was Friday, August 22, 2014. This was a Limited in theaters release. 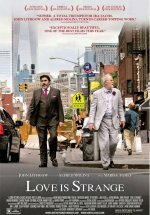 Ben and George take advantage of New York's new marriage laws and tie the knot after being together for 39 years. Unfortunately, the Catholic school where George teaches does not approve, and they reluctantly fire him, forcing the couple to split up and stay with friends while they sell their apartment and look for cheaper housing. George crashes with two gay police officers, while Ben, who's a painter, bunks with his nephew's family in Brooklyn—a temporary situation that weighs heavily on all involved.